Follow the steps below to learn how to write a Meta Description for SEO that will drive higher click-through rates, support a killer SEO strategy, and that aligns to SEO best practices. 1. What is a Meta Description? Meta descriptions are HTML [su_highlight]<meta>[/su_highlight] attributes that provide search engines with succinct human-readable descriptions of the expected content on a given web page. 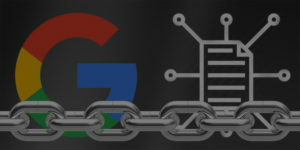 Although Google has said in the past that Meta description tags (as well as Meta Keywords) are not important to search engine rankings, since Google will sometimes use the meta description of a page in search results snippets, they are extremely instrumental in generating user click-throughs from SERPs. These short snippets are a brand’s front-line opportunity to showcase their site’s unique content and value proposition to searchers. Additionally, good Meta Descriptions provide a searcher with more information on exactly whether the given page contains the information that they’re looking for or not. Essentially, a well-written Meta Description may be the difference between drawing clicks versus being passed over in the SERP. 2. Where can you find the Meta Description? The Meta Description does not appear to a user as on-page content, and is only viewable to robots within source code. On a page-by-page basis, you should be able to pop open a site’s source code and find the page’s Meta Description within the [su_highlight]<head>[/su_highlight] area. 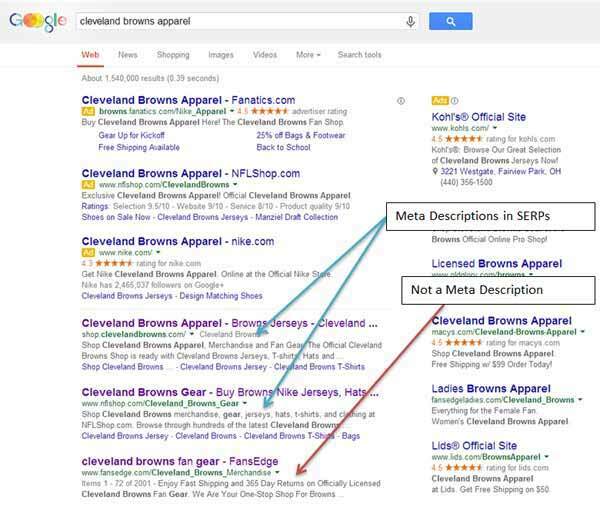 Meta descriptions are most commonly used on search engine result pages (SERPs) as the preview snippets each organic result/listing – especially if Google thinks it gives users a more accurate description of the contents of a page than would be possible purely from showcasing the on-page content. In the example below, you’ll see a SERP where Google chose to pull in the Meta Description for the first two results, and pulled in on-page text to display as the snippet for the third result (probably because the on-page copy matched the search query better). The Meta description should consist of one or two sentences typically between 140-160 characters (with spaces) that elaborate on the page’s title by using primary and secondary target keywords to convey the value proposition and CTA. The standard format is sentence case. Using anything above 160 characters is likely to mean that your SERP description will be truncated – meaning your full message and Call-To-Action (CTA) isn’t likely to be seen by searchers. Since search engines may only display 160 characters (including spaces), work to get your message across within that constraint. On Meta Descriptions that exceed 160 characters, it is especially important to ensure that your core message is included before the point of truncation. 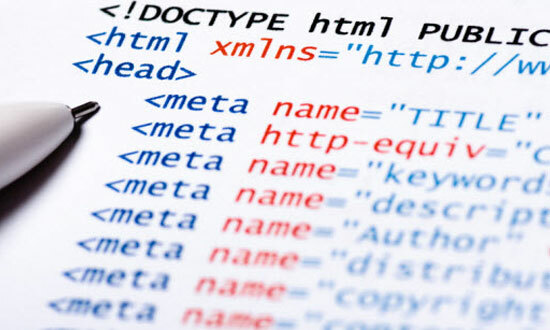 As mentioned above, Meta Descriptions are often a brand’s first opportunity to showcase their site’s unique content and value proposition to searchers. Therefore, you should focus on crafting a highly targeted message for each page. Within the description, be sure to use verbiage that hits on the client’s overall value proposition and the unique value of the page being described. Generally, the first sentence of any Meta description should include some sort of an action verb, and then include the targeted keywords and should present searchers with a compelling call-to-action to entice them to click on the listing. Ensure that the description elaborates on the information within the page title and descriptively and accurately portrays the contents of the page it represents. Writing copy the misrepresents the page is a quick way to turn off customers and increase your page’s bounce rate. Just like most things SEO, including your page’s target keywords remains critical. Be sure to include a unique, keyword-rich description for the most important keywords and phrases for the page (i.e. page’s primary and secondary keywords). When the keyword searched matches a word in the Meta description, it will appear bold in the search engine results. This makes the listing more prominent, usually contributing to a higher click-through rate – especially when users see exact or partial matches of their search query within the SERP description. If possible, using target keywords closer to the beginning of the Meta Description may prove beneficial as well. However, be sure to keep the description human readable and don’t try to stuff too many keywords in. Google suggests providing clearly tagged facts, which could be a good source of information. 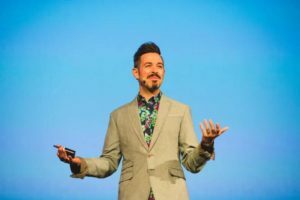 However, due to the way they work on-page structured data into the SERPs these days, I’d suggest forgoing this method unless absolutely necessary. Every page should contain a Meta Descriptions that is 100% unique and should not be duplicated anywhere else on the site. Otherwise, you may suffer from reduced rankings due to duplicate content issues. As space is at a premium, and because it has already been used in the Title, try to avoid re-using the brand name unless it is absolutely necessary. Special characters such as ®, ™, and © should be avoided here if possible as they take up valuable character spaces. Any time quotes are used in a meta description, Google cuts off the description. To prevent meta descriptions from being cut off, it’s best to remove all non-alphanumeric characters from meta descriptions. If quotation marks are important in your meta description, you can change them to single quotes rather than double quotes to prevent truncation. Meta description content within page templates should default to pre-defined concatenation schemas with the ability to manually override and customize the text. A long click occurs when a user performs a search, clicks on a result and remains on that site for a long period of time.Essentially, what you’re trying to do is compel a user to click your listing and keep them there – thus a long click. While many other factors impact long-clicks, writing an effective Meta Description is a key piece of the puzzle. When I consider this concept, it leads me to believe that Meta Descriptions are a factor that leads to good rankings – even if it is indirect. As of 2013, there was at least some sentiment from those in the industry that there is indeed some correlation between good Meta Descriptions and good rankings. There are “many ways to skin a cat,” and Meta Descriptions are no different. If you find an approach that works for you, use it, even if it falls slightly outside of what I’ve said here. 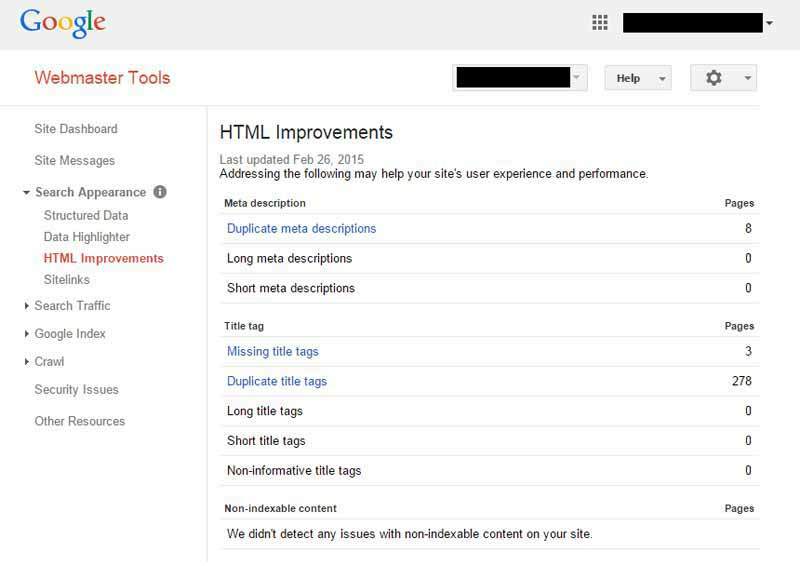 A great tool to make connections about what might be working well is Google’s Search Analytics report which is available in Google Webmaster Tools. 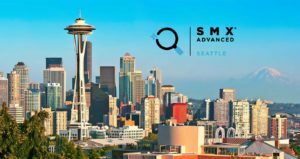 Knowing what you know about your page-level optimization strategies and Meta Description strategies, this type of data is powerful if you know how to use it. If you see that a certain approach is leading to a higher click-through rate than another, take advantage of it.